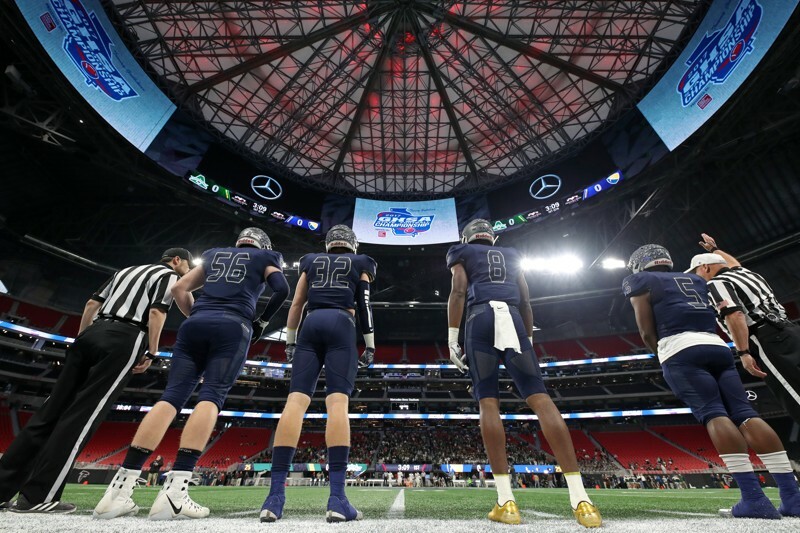 The GHSA has made a contingency plan for the 2018 Football State Championships in order to avoid a potential scheduling conflict with Mercedes-Benz Stadium’s resident soccer team, Atlanta United, and the 2018 MLS Cup Final. As it stands, this year’s eight football state championship games are scheduled for Friday and Saturday Dec. 7-8 at Mercedes-Benz Stadium. The MLS Playoffs kickoff in November and the MLS Cup is scheduled for Dec. 8. The team with the best regular season record earns the right to host the MLS Cup, and red-hot Atlanta United is currently sitting on the top of the Eastern Conference table 21 matches into the season with a league-high 41 points. Score Atlanta reached out to Executive Director of the GHSA Robin Hines for comment, but he was unable to speak because the contract negotiations with Mercedes-Benz Stadium were ongoing. Nevertheless, this proactive measure adds an important safety net to the scheduling that was not in place last December when inclement weather disrupted the football state championships, allowing just two of the eight games to be played at Mercedes-Benz Stadium and dispersing the remaining to six games to six separate locations the following weekend.